This artwork was made possible by the support of my Patrons! 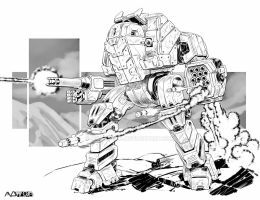 Sure, all my Battletech/Mechwarrior fanart is free to use for non-commercial projects...take what you need! How did you do the Hatchetman model? it looks amazing (all of it that is)! That's impressive! Got bored of pgi's models already??!?! House Kurita vs. House Davion I believe. Looks awesome! PS: isn't that Assassin a little too big? To improve perspective, I would change it's lasers to hitting the Stalker side torso, not the back. Oh, indeed! Thanks for the reply (and the behind the scene). I would show the entirety of the centurion's right arm and enhance it's silhouette a bit (as it looks like it's shooting from the crotch) but verall it's pretty damn cool!. I think it is a Goner! Flanked at all sides! Mayday Mayday! Definitely looks like one with the cockpit and club-like implement of close combat damage. But I think they're still trying to figure out close combat attacks for MWO. I'm not so sure that melee should be implemented in MWO. The meta so far is long-range sniper builds (or at least from what most meta-freaks play). If they really want to implement melee, they should try something on the lines of having to change "stances" so to speak. For example, when you switch to melee mode all other weapons are disabled and you have to manually swing the arms to hit the enemy mech or to block him (kind of like Mount&Blade). That and make some melee upgrades like endo-steel and ferro-fibrous but for the arms, like adding blades or claws like the Kodiak has. Either upgrades or straight up a new category of weapons, the melee weapons. As far as I remember the metagame now is that you're dead weight if you don't carry heavy lasers / ppc / Gauss cannons. Read: Anything that can deliver damage on long range. LRMs: Pff. That damage is pityful if you don't have a whole company firing them. SRMs: Have fun trying to get close enough. Light Mechs: Yeah... sure. Your opposition is roughly 40t more and carries more armor than you bring to the field in total but have fun! Though I gotta admit: My PPC Commando WAS fun. Yeah, that sums it up pretty well. Although, LRMs are still worth their weight. I have quite some LRM boats (an archer, trebuchet, mad dog, cyclops, ect.) and they work like a charm, on average about 500 damage with above average at about 700 damage. Positioning is important and sometimes when the enemy sees a gauss-ppc build they focus them and not you. As for SRMs and lights, well, depends on the player. A buddy of mine has a Mist Lynx with 2xStreak 4 and 2 MGs. I have absolutely no idea how but he manages to deal between 300 and 500 damage. No idea whatsoever how it works for him. It is possible to make quite some kills with a light one but even more than the bigger mechs: Position is everything. If you're not there in that split second the enemy turns for a larger target to unload your guns: chance gone. My best match with a SRM Commando was 4 kills at over 600 damage. But that was one. Usually I end up somewhere around 100 damage and not a single kill. Damn, 600 in a Commando. Impressive. I know what you mean though, I can't play well with most lights. With an Adder however, damn, that thing can both pack a punch and take some (for a light anyway). What's your ingame tag btw. Maybe we'll meet in a match. Mine's Futirocopteru. Should be The2ndPete, I'll just send you a request next time I boot it up. 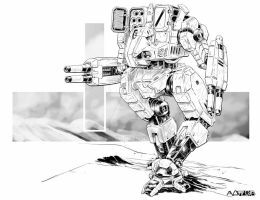 The absolute most fascinating facet of this particular Work of Mech Art? Over the course of its creation SpOoKy777 released 5-separate Patreon-exclusive Artwork-In-Progress glimpses into its creation to his Patreon Patrons! He even permitted us to submit naming suggestions! I am not artistically-inclined myself, so the shared process and insights were very much anticipated and appreciated. GREAT WORK, Good Sir! Dude..magnificent.. really love how you blacked out the top dome to really accentuate the frontal cockpit, too! Spooky your art is awesome, love the attention to detail and your scaling! Fantastic!